When asked what buzzwords come to mind when talking about millennials, the words “entitled”, “self-centered”, “trophy kids” and “snowflakes” were blurted out from audience members. But Scott Zimmer assured them that, contrary to popular belief, millennials do not purposefully try to come off as conceited brats. “Millennials actually don’t wake up in the morning and say ‘how can I be a disrespectful, arrogant person today?’” Zimmer said. 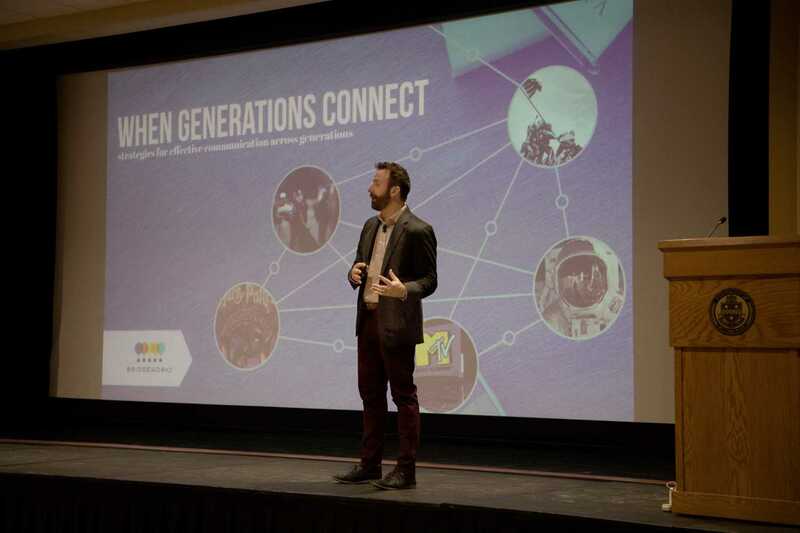 Zimmer, a generational expert from the consulting company BridgeWorks, was a keynote speaker at The Office of Diversity and Inclusion’s Social Justice Symposium. The event was was attended by 260 faculty, staff and students. Zimmer led the first half of the event and spoke about bridging generational gaps in the workplace. Zimmer said it is inevitable that generations will clash and experience stress points. He said these tensions don’t stem from the workplace, but rather from adolescence and the way people were raised. Zimmer explained that in their formative years, baby boomers were raised in households that were more of a dictatorship than a democracy, where children were seen and not heard. He said when a lot of these boomers grew up, they didn’t want to raise their kids the same way their parents raised them. According to Zimmer, a strategy to bridging the gap between millennials and older generations is to provide opportunities for feedback. Zimmer said 80 percent of millennials say they prefer immediate feedback, which comes from growing up in an age where new technology and social media were extremely prevalent. Zimmer explained that another sticking point between generations is the idea of collaboration. In the Gen X formative years, Zimmer said the divorce rate doubled, causing people to become immensely independent, self-reliant and also skeptical at a young age. Comparing Gen X video games that were typically one to two players to millenial games like Wii Sports and Bop It that are multiplayer, Zimmer noted that millennials also tend to value teamwork more. But despite all these differences and areas of tension, Zimmer said there are ways to be inclusive of everyone in the workplace and that bashing millennials will not facilitate progress. Zimmer said by 2020 millennials will comprise 50 percent of the American workplace and that open communication and freedom to let them express their ideas is key. Sherdina Harper — coordinator of the department of cross cultural and leadership development programming — who attended the event, said she thinks one of the biggest challenges working with diversity is lack of knowledge of one another. After Zimmer spoke, the audience participated in a game called Fast Feud where members had to guess the most-picked answer of a survey to get the question right. The three major generations — millennials, Gen Xers and baby boomers — competed against each other. The questions centered around pop culture topics specific to each generation. Harper said the game show portion of the symposium was like “icing on the cake” and that it was an effective way to approach a subject in a non-threatening way. Summer Rothrock, director of the CCLD, also said she enjoyed the game and found it exciting, but also found Zimmer’s speech to be very compelling.